An epic journey through the economies of ancient civilizations, and how they managed debt versus social instability. 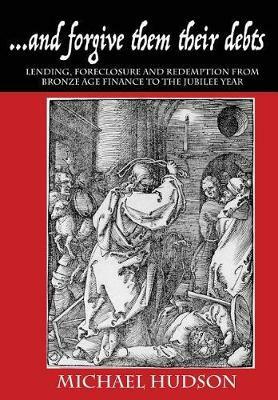 Shocking historical truths about how debt played a central role in shaping (or destroying) ancient societies (viz: Rome), and that the Bible is preoccupied with de... read full description below. In ...and forgive them their debts, renowned economist Michael Hudson - one of the few who could see the 2008 financial crisis coming - takes us on an epic journey through the economies of ancient civilizations and reveals their relevance for us today. For the past 40 years, in conjunction with Harvard's Peabody Museum, he and his colleagues have documented how interest-bearing debt was invented in Bronze Age Mesopotamia, and then disseminated to the ancient world. What the Bronze Age rulers understood was that avoiding economic instability required regular royal debt cancellations. Professor Hudson documents dozens of these these royal edicts and traces the archeological record and history of debt, and how societies have dealt with (or failed to deal with) the proliferation of debts that cannot be paid - and their consequences. In the pages of ...and forgive them their debts, readers will discover how debt played a central role in shaping ancient societies, and how it continues to shape our world - often destructively. The Big Question: What happens when debts cannot be paid? Will there be a writedown in favor of debtors (as is routinely done for large corporations), or will creditors be allowed to foreclose (as is done to personal debtors and mortgagees), leading to the creditors' political takeover of the economy's assets - and ultimately the government itself? Historically, the remedy of record was the royal Clean Slate proclamation, or biblical Jubilee Year of debt forgiveness. The Real Message of Jesus: Jesus's first sermon announced that he had come to proclaim a Clean Slate debt cancellation (the Jubilee Year), as was first described in the Bible (Leviticus 25), and had been used in Babylonia since Hammurabi's dynasty. This message - more than any other religious claim - is what threatened his enemies, and is why he was put to death. This interpretation has been all but expunged from our contemporary understanding of the phrase, ...and forgive them their debts, in The Lord's Prayer. It has been changed to ...and forgive them their trespasses (or sins), depending on the particular Christian tradition that influenced the translation from the Greek opheilema/opheiletes (debts/debtors). Contrary to the message of Jesus, also found in the Bible and in other ancient texts, debt repayment has become sanctified and mystified as a way of moralizing claims on borrowers, allowing creditor elites and oligarchs the leverage to take over societies and privatize personal and public assets - especially in hard times. Historically, no monarchy or government has survived takeover by creditor elites and oligarchs (viz: Rome). Perhaps most striking is that - according to a nearly complete consensus of Assyriologists and biblical scholars - the Bible is preoccupied with debt forgiveness more than with sin. In a time of increasing economic and political polarization, and a global economy deeper in debt than at the height of the 2008 financial crisis, ...and forgive them their debts documents what individuals, governments and societies can learn from the ancient past for restoring economic and social stability today. Michael Hudson is a veteran of Wall Street and Distinguished Research Professor of Economics at the University of Missouri-Kansas City (UMKC), and Professor of Economics at Peking University. He is President of the Institute for the Study of Long-Term Economic Trends (ISLET), and the co-editor of The International Scholars Conference on Ancient Near Eastern Economies (ISCANEE) series (5 volumes), sponsored by the Harvard Peabody Museum. He has consulted with the U.S. and foreign governments on taxation, balance of payments, financial bubbles, land policy and financial reform. He gives speeches, lectures and presentations throughout the world for official and unofficial groups reflecting diverse academic, economic and political constituencies. This book, ...and forgive them their debts, is Volume I of the trilogy, THE TYRANNY OF DEBT.